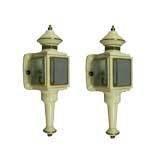 #2-422, carriage wall sconces with bevelled glass. 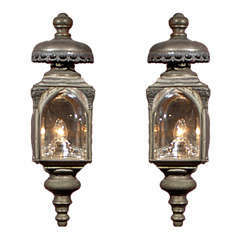 #2-422, carriage wall sconces with beveled glass. 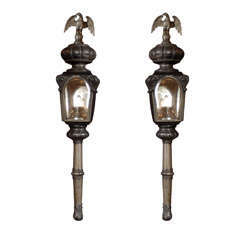 On sale #2-1735a , a pair of French wood and brass single arm sconce. The wood center has a gold leaf finish. 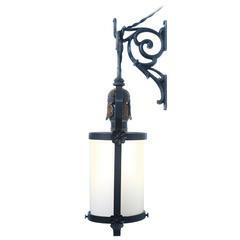 This is a nice clean iron fixture with a milk glass tubular shade. 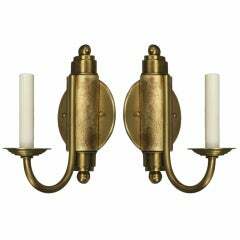 It hangs as a small pendant but comes with an interesting wall bracket to hang as a sconce if wanted. 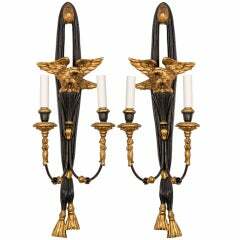 Pair of vibrant and colorful enameled metal floral two-arm Italian candlestick sconces from the 1940s. This can be seen at our 400 Gilligan St location in Scranton, PA. 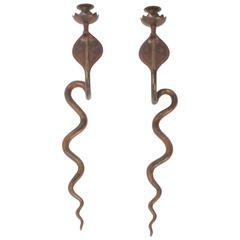 Exotic pair of candle power snake sconces crafted in brass and decorated with red enamel.